Garnish with cashew, almond and pistachio and ready to serve. Turn off the flame, serve it as it is or garnish it with aloo bhujiya/sev and lemon slices. Turn on the flame and heat a pan, add jaggery and let it melt on low flame for 2 minutes. Increase the flame to medium and cook it for another 2-3 minutes, keep stirring. 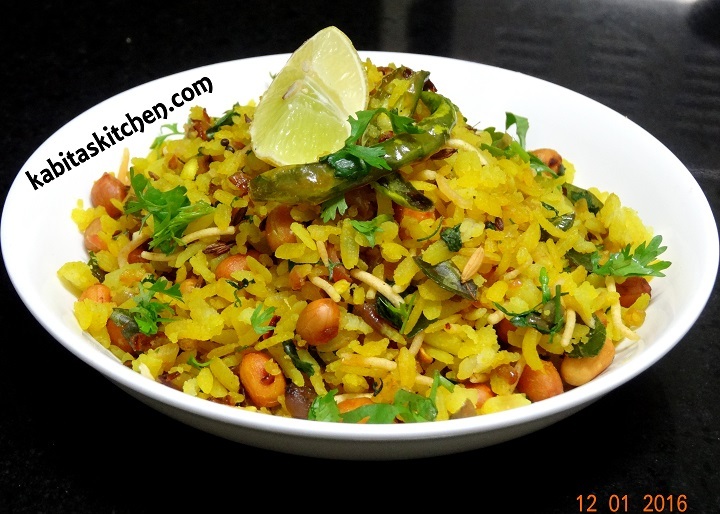 Turn off the flame and add murmura (puffed rice). Mix it properly and let it cool down a little (approximately 2 minutes). Grease your palm with water, take a small portion of the mixture and roll it into small ball. Make sure that laddoos are made before the mixture cools down. 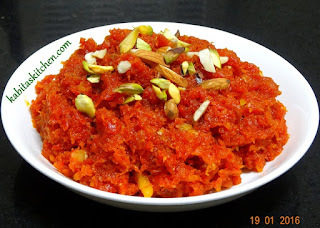 Repeat the process for making laddu from remaining mixture. 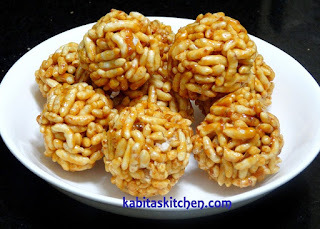 Murmura laddu is ready to serve, store it in airtight container and consume it within 2-3 weeks. Caution: Ensure it is not too hot before making the laddu. Chop the potato into small-medium size pieces. Heat oil in a pan, when oil is heated properly, add cumin seeds and fry it for few seconds. Add ginger garlic paste, fry it for a minute on medium flame. Add red chilli powder, turmeric powder, cumin powder and coriander powder. Fry it for a minute on low flame, keep stirring. Add chopped tomato, fry the tomato for 3-4 minutes on low-medium flame(cover the pan). 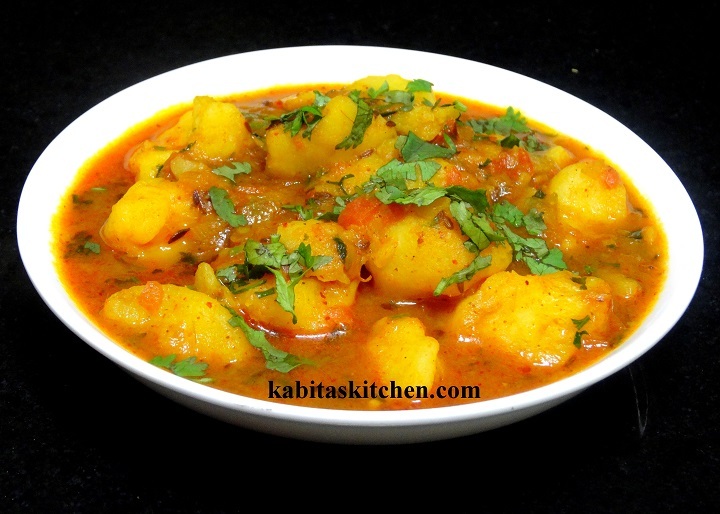 Add potato, salt and dry mango powder in the pan and mix it properly. Add 1.5 glasses of water, mix it and cover the pan, cook it for 3-4 minutes on low-medium flame. Add garam masala powder and mix it, cover the pan and cook it for another minute. Turn off the flame, garnish with coriander leaves and serve with roti, poori, paratha or kachori. Grate/mash/blend the boiled potato in a bowl. Add gram flour, asafoetida, garam masala powder, turmeric powder, red chilli powder and salt to taste. Mix it properly and knead it into dough (add little water if needed). Add little oil into the dough to make it smooth. 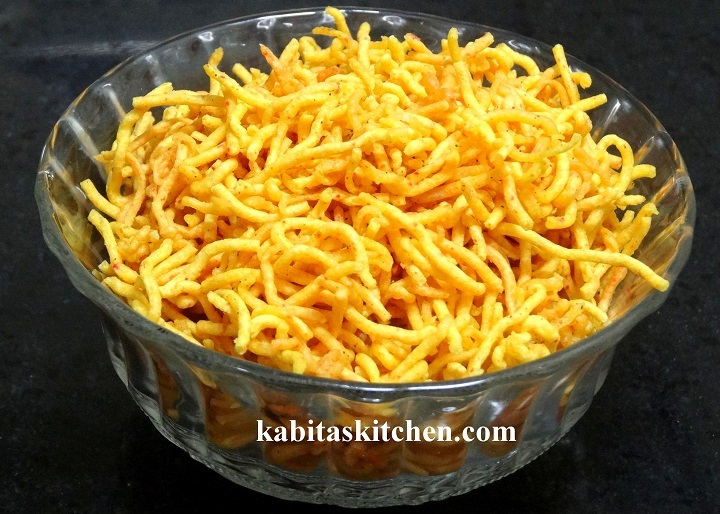 Take bhujiya making machine or sev maker and grease it with little oil from inside. Take the prepared dough and roll it into a log and gently place it in the bhujiya machine and close the cap. Turn on the flame, heat sufficient oil in a thick and deep pan. Carefully, press the bhujiya maker directly over the hot oil, move bhujiya maker it in a way that the bhujiya is evenly distributed in oil. Fry it on medium flame for few seconds and then flip it to fry other side. Once the bhujiya turns golden and crispy, take it out on kitchen towel to absorb extra oil. Slowly crush the fried bhujia to make small pieces, sprinkle little chat masala over it. Ready to serve, you may store it in an air-tight jar and consume it later.